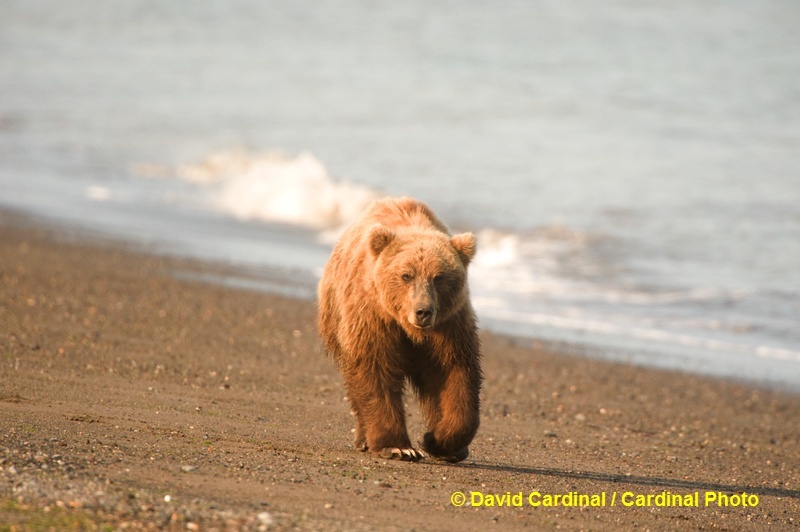 I've been photographing Alaskan Brown Bears on the Cook Inlet for a decade now, but it hardly seems that long. Each year when I first step off the bush plane and am on the ground with them the excitement is rekindled. Many others have found the same thing--in fact my first group this year was composed entirely of repeat visitors, certainly a first. No matter how much time I spend in Africa photographing from vehicles it is different to be working on the ground safely at eye level with wild animals this large and powerful. It is truly a unique opportunity that can't be found almost anywhere else. 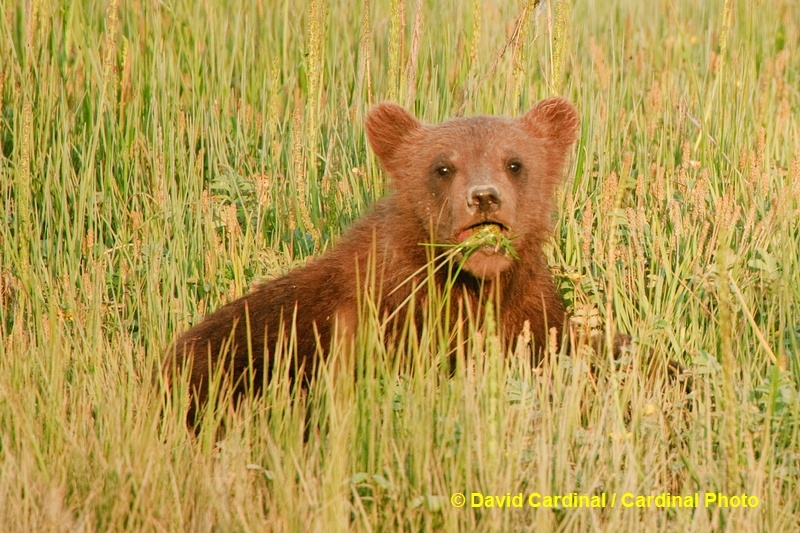 Each year the bear photography has gotten better for a few simple reasons. First, the bears have become more comfortable with having small groups of photographers near them. We never pressure or stress them by advancing too close to them, but instead let them work their way towards us if they are okay with it. This is the best plan to keep them and us healthy and the area natural. There are no pre-set viewing platforms or pre-defined trails. 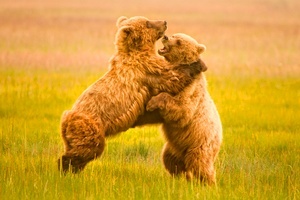 We work in the bears' habitat and on their terms. Second, photo technology continues to advance at a rapid pace. My first trip here in 2000 I was shooting 100 ASA (ISO) film with a non-image-stabilized lens and changing rolls every 36 exposures or if I wanted to push my film to 200. This year everyone was shooting with cameras that did a good job at 400 ISO or even higher in the case of the full-frame models. And most of our lenses had some form of built-in stabilization which is very helpful in the wind. Third, of course, we've gotten better at it. Personally I've now spent a total of almost 20 weeks in this area with many of the same bears and their families over the years, and our bear guides have been doing it just as long and for the entire season each year. Finally, hats off to David Coray, the lodge owner we work with for continuing to keep the place and the groups small and personal. 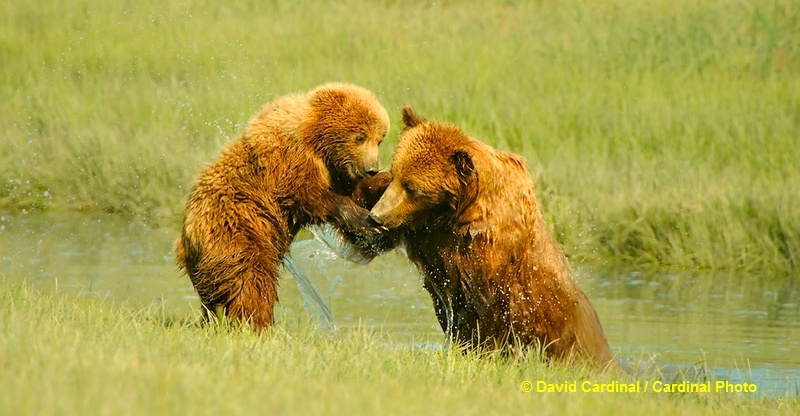 Participants who have been with us and to Brooks say there is no comparison between the dozens of folks being shuttled to and from the platform at Brooks and the 5 or 6 photographers working with a guide and photographer in a meadow otherwise empty expect for a variety of brown bears. And as always having great participants makes for great trips. Our first group of returners included the Davenports--who also joined me for some eagle photography in Homer before the trip, long-time site and forum contributor Adam Felde, and previous lodge visitor Betty Hoyt. Our second safari was all couples with the DesJardains, Zieglers and Coghlins all providing plenty of lively repartee and good spirits as we (finally) dealt with a couple days of rain after nearly two weeks of solid sunshine. Once again Drew was our awesome bear guide. One reason I really enjoy the low-stress environment for the bears in Lake Clark Park is that we get to see the cubs in action. They are naturally curious and playful and a delight to watch and photograph. I deliberately schedule trips for weeks when the new "Spring" cubs are typically out in the open (they tend to come out from the moutains and hills with their mothers last in the spring and often disappear early). Razor clams abound along the coast of the Inlet and the bears have become accustomed to taking advantage of low tides to dig for them. It's great to watch and provides some unique foregrounds and backgrounds for photography. Often there is a mist to add a creative element to the image. One reason I always work with a bear guide in these situations is it allows all of us to concentrate on our photography and get eye level images like this one (only possible by getting down low) while the guide keeps an eye on our safety and on any other bears that might be approaching. 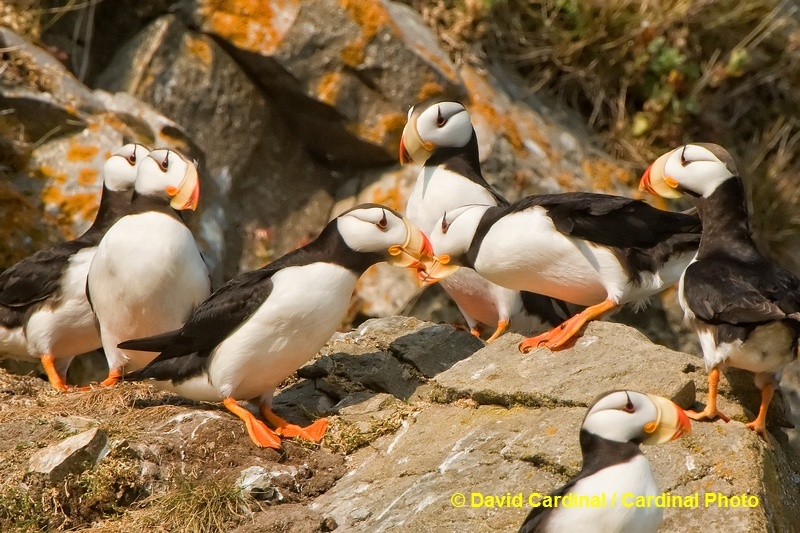 Of course our Bear and Puffin safari wouldn't be complete without Puffins! A beautiful Puffin rookery is only a short boat ride away. In the lodge's new and custom designed photographer friendly boat it is less than an hour along the scenic coast photographing waterfalls and mountains on the way. We photograph both Horned Puffins and Tufted Puffins there, as well as Common Murres, various Auklets, Oystercatchers, Bald Eagles, Glaucous Gulls, a variety of Cormorants, Eiders, and Kittiwakes. The green foliage, golden-colored lichen and purple flowers make a wonderful background for photographing the Puffins. We photograph them from the boat and also from the rookery island itself. Often a small amount of minus exposure compensation is needed to keep the white breasts of the Puffins from burning out. Your chance to join us for 2010! We're excited to be headed back to the Cook Inlet in 2010. 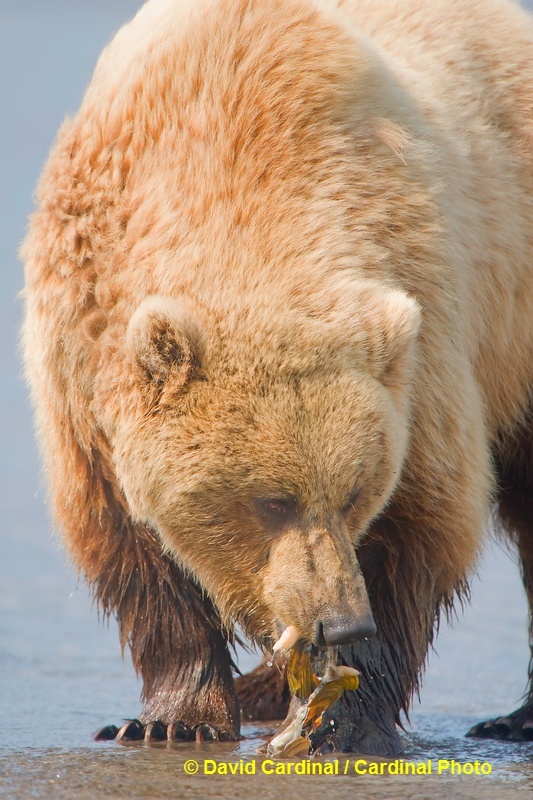 Once again we've scheduled the trips for the peak bear activity in mid-July. We have two sessions scheduled, July 8-15 and July 14-21. You can learn more about the trips for sign up early for our early bird discount online. In addition to the bear trips for 2010, we want to remind everyone that we still have a single opening for a woman willing to share on our quickly upcoming November trip to Botswana. And our December trip to Cambodia and Burma is still fairly wide open. Remember too that we've added a brand new trip for 2010--Texas Hill Country Bird Photo Safari as a back to back trip with our very popular Texas Rio Grande Valley Bird Photo Safari. You can attend one or both--those attending both get a discount & free transportation between them. Much like on our Texas trip our loaner Sigma 120-400 was very popular with all the participants who weren't using a 200-400f/4 or 500f/4 already. It out-performed both the Canon 100-400 and the Nikon 80-400 consistently. And of course since it is made for both systems everyone can take advantage of it. Several were being ordered by the time the trip was over. At less than $900 it is a great deal for anyone looking for an "entry level" safari lens. If you purchase the Canon version of the Sigma 120-400 or the Nikon version of the Sigma 120-400 through these Amazon links you help support our newsletter. If you prefer B&H they also have the Nikon version of the Sigma 120-400 at a competitive price as well as the Canon version of the Sigma 120-400. I also used a pre-production version of the new Lowepro X200 roller, which I'll be writing more about in our next issue, but suffice it to say that it is quite an exciting bag that should be available for purchase soon. * Stereo mic input for video (built-in mic is mono)* Possibly upgraded to 8fps (nice, but we can get that with the vertical grip now)* Possibly a "quiet shutter" option--which sounds nice but I'd mostly want it for birds, when I'd also want 8fps, so I'm guessing it might not help for that but would for quiet concerts, churches, etc. The new 70-200 model lens will feature VR II, good for up to 4 stops of vibration reduction. More importantly it should produce better images (less vignetting) on the D3 and D700. It is also slightly smaller than the current version but with a heft price tag expected to be $2400 when it is available in September. The 18-200 gets a mild makeover with VR II and an updated zoom mechanism designed to reduce creep--along with a zoom lock switch. Both lenses also get updated coatings designed to further reduce glare and lens flare. The downside on the new Nikon 18-200 VR II is also a bump in price to about $850 when it will be available in September. Importantly for action photographers Nikon introduced a much needed update to the Nikon 70-200 f/2.8 VR lens and a minor update to the popular Nikon 18-200 VR lens. The new 70-200 model lens will feature VR II, good for up to 4 stops of vibration reduction. More importantly it should produce better images (less vignetting) on the D3 and D700. It is also slightly smaller than the current version but with a heft price tag expected to be $2400 when it is available in September. Do either of these lenses appeal to you? Do you expect to upgrade? Let us know in our Photo Tools Forum. We've had an amazing thread started by long time contributor Rick Moore on the changing economics of event photography with the advent of digital. Readers have been very open about sharing their issues and solutions to the often declining sales of prints and concurrent increase in demand for various digital alternatives. Please join us and share your thoughts in our Photo Business forum. If you have a hot tip or news item for DigitalPro Shooter, write us at dps@proshooters.com. If your tip or news item is picked as the Shooters' Tip of the Week, we'll send you a really cool DigitalPro hat! Or just write us to let us know what you think of the newsletter. To keep up with the latest articles and reviews, join me at http://www.nikondigital.org. For the latest versions of DigitalPro, visit http://www.proshooters.com/dp.